The jaunty little Bavaria 31 Cruiser is surprisingly roomy for its size, and offers plenty of performance and aesthetic flair. The vanguard of the new line of Bavaria Cruisers, the 31 has more contemporary or rounded deck mouldings, a higher coach house for more interior volume, more opening portlights than the models before it and, to my eye at least, it looks finer in the bow as per the recent trend in hull shapes. There's some of that concave shape near the entry to help reduce pounding, among other things. For the cruising set there are even more surprises in store. Who would have expected an electric opening transom? Press a button and you get an inviting stern-to entrance into a decent cockpit with 2.2-metre long cockpit seats. That's the same size as the 37! Add the barbie on the rail and you can eat and swim – the ladder is an integral part of the extending transom come dive board – while anchored just beyond the beach. Oh, yeah, a windlass is provided to make that a snap and the hot-cold transom shower comes gratis from the German yachtbuilder. Accommodation, meanwhile, spans two double cabins at either end of the boat. Of course, you’re wondering about headroom – about 180cm by my reckoning. Meanwhile, the galley comes with a two-burner stove/oven and top-loading 12V fridge in which frozen goods will stay that way for some days, the WC is big with a pressurised handheld hot/cold shower and electric head (both local upgrades), and with only one aft cabin you get a huge sail locker. And the nice big settees in the saloon double as sea berths, impromptu beds for kiddie's friends and daybeds after that long lunch. Put it all together, along with the supplied boathook, fenders and mooring lines, and you have a neat little yacht for carefree cruising. You can gad about the coast should the mood strike you or simply cruise the harbour, lake, river or bay. Either way, the little Bavaria is comparatively big on comforts. The Germans have fashioned the hull of the 31 Cruiser (32ft 1in overall) from lashings of resin and rovings, with a glassed-in GRP subframe and Kevlar reinforced bow sections. The keel is a cast-iron fin with squat bulb drawing 1.87m. There’s a twin fin shoal draft version if you must. Actually, it's quite high-tech. Of course, there was a locker for the supplied 4.5kg stainless-steel bottle for the aforesaid barbie and stove, plus optional halyard bags and cockpit speakers for the Jimmy Buffet. A decent grade of non-skid and double lifelines with solid stanchions make going forward a snap. But with the supplied windlass, 50m of chain and Delta anchor you don't need to worry about such things. On the engineering front, the yacht has gas cooking, 12V systems with separate 55-amp engine-start battery and 140-amp house battery, but also 240V Shorepower and battery charger, plus AC outlets that might come in handy when tied to the marina. I will add that the Bavaria switch panel at the nav station is a smart bit of work and way better than what you find from many high-volume production yachts. The freshwater supply is 155 litres, enough for a weekend with profligate kids aboard or a week for a savvy cruising couple. The 90-litre fuel tank will last for a few days motoring with the freshwater-cooled three-pot Volvo Penta D1-20, which has a big 150-amp alternator and Saildrive. The motor revs to 2800rpm, makes maximum torque at 2400rpm, where it produced six knots boat speed for 2ltr/hr. The engine-start and electronic-stop controls buttons are on the engine panel on the steering binnacle. Motor going and, even despite the big winds, I found the 31 a snap to take out of its berth and, with the Saildrive, responsive to the wheel. It's quiet, too, which is how we like our yacht kickers. The prop is a three-blade folding number. I checked engine access under the companionway steps – more raked and safer than the Bavaria steps of yore – and it’s very good. You can reach the overflow bottle from the header tank, oil dipstick, the sea strainer back aft, the bilge and belts through the main hatch and side panel in the portside cabin. The deck-stepped, single-spreader 7/8th aluminium Selden stick was fitted with an optional solid vang or rod kicker. Deck gear is all Rutgerson including the 'genoa' tracks and adjustable cars and mainsheet system with traveller on the cabin top. Only a small section of boom protrudes into the cockpit where it's about 1.8m high. 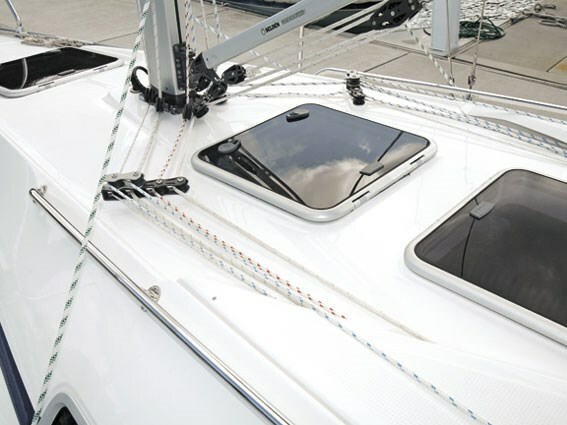 It's nice to see the halyards are encapsulated under GRP covers on the cabin top. The lines all lead back under the optional factory fitted dodger, much appreciated on this blustery day, to two-speed Lewmar 18s. The primaries and mainsheet winches are two-speed Lewmar 30s and interchangeable. With active crew, you can have the mainsheet winches close to the wheel. If shorthanded, bring the headsail sheet there and tack yourself. The upgraded Elfstrom tri-radial sails, which should keep their shape longer than the standard Dacron set, include a fully-battened main, which drops into lazy jacks and a boom bag, and a furling No.2 headsail. You could fit a No.1 and/or asymmetrical spinnaker, plus a pole for goosewinging it if you want to partake in the odd twilight and Saturday race. The demo yacht also had full covers, including a bimini for shade at lunchtime. The folding timber table is really generous, there's a built-in icebox for stowing refreshments, and the seating is big enough to accommodate four to six. The optional LED cockpit lights were another nice touch. Although the yacht has wheel steering (Spinlock leatherbound) and a big central pedestal for mounting electronics, including a chartplotter (Raymarine 80 and Tridata supplied), you can remove the wheel in a matter of seconds and create an even more spacious setting. A folding wheel is another way to go if you like to entertain. Either way, the little yacht has a big cockpit with huge sail locker big enough for the deflated duckie, 2hp outboard, fishing lines and crab traps… all the cruising essentials are in place. 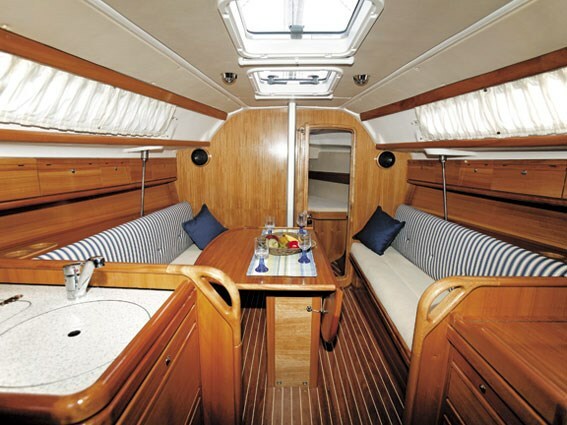 … means goodnight in German, which you are assured on the Bavaria 31 Cruiser, with its two big cabins. But instead of a washboard as per the 30 it replaces, there are now opening timber doors leading into the cabin of the 31. It was finished with light mahogany joinery and had fiddle rails and handholds where you need them, plus more hatches in the cabins and saloon for added light and fresh air. The big moulded white head compartment to starboard has a hanging locker for your wet-weather suit; the navigation station near its entrance is really big for a 31-footer, with a big chart table, VHF, stereo with MP3 player and more; while the port cabin features a double berth and hanging locker. The forepeak is much bigger than the old 30 and truly sleepable for a couple. There’s another hanging locker, side lockers and an easy-clean, moulded liner here as well. Of course, it's the bit in the middle (the saloon with big dinette flanked by settees with nautical blue-and-white upholstery) that will see the lion's share of attention. This yacht also has a decent galley with the two-burner stove and oven, Waeco fridge, big round sink in which to stack the plates, pressurised water and concealed garbo. Pantry space is fine. Apparently the owner, an ex-powerboater who looking for a new challenge, wants to potter about in his 31 Cruiser. The interesting thing I'm seeing here is that yachts are becoming more amenable, easier to sail, with more amenities, thereby luring powerboats to the fold. Who would have thought an entry-level Bavaria 31-footer would have electric-opening transom, electric loo and so much space below decks, for example? And who would have thought it would be so easy to sail in 15-20 knots…? Meantime, this was an especially enjoyable sail in the sprightly southerly whistling down the bay. 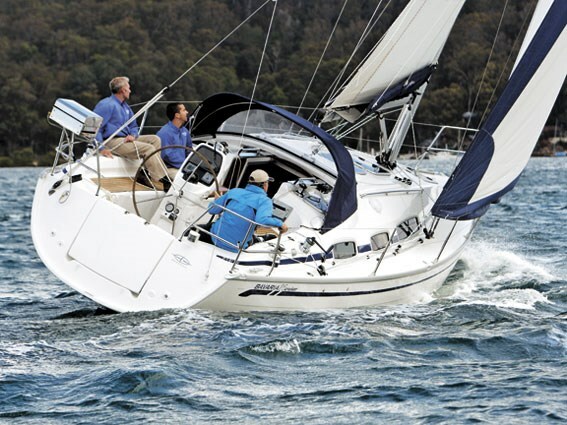 The Bavaria 31 held its own and flew the full set of sails with no reefing needed. On the reaches we clocked as much as 7.6 knots. Upwind, we were sailing in the 6-6.5 knots – very respectable. 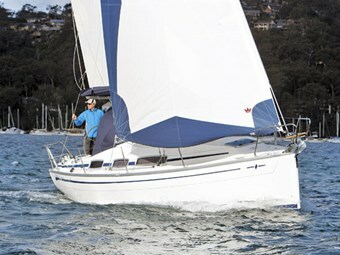 The helm is balanced and, if you split the wind a tad, you can sail at 30 degrees and make good headway. With one big tack near Newport, we took the layline straight back to the marina. The yacht never really felt pressed and once did we dump the main. Yet it was cruising to nowhere in particular that mattered more. You can sail this boat while enjoying the views, the company and, later, the amenities without getting your knickers in a knot over failing to make the most of a puff or two. And for the yacht's owner, it's an ideal toe-in at $198,721 cruise away, including electric swim platform, rail-mounted barbie, electric head and more. Simple.